Depicts Chickasaw and Choctaw Territory just prior to Trail of Tears. A beautiful example of Finley's important 1827 map of Mississippi. Depicts the state with moderate detail in Finley's classic minimalist style. Shows river ways, roads, canals, and some topographical features. Offers color coding at the county level. Title and scale in lower left quadrant. 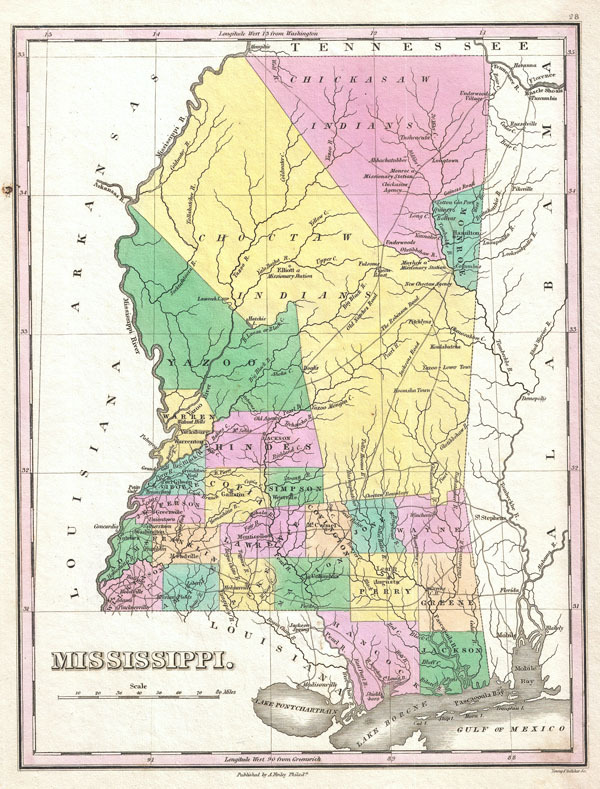 Finley's map of Mississippi is particularly interesting and important due to its portrayal of the rapidly changing American Indian situation in the northern part of the state. In 1827 most of northern Mississippi was a confined territory assigned to the Chickasaw and Choctaw Indian Nations. Within the Indian lands numerous missionary stations are noted, including Elliot, Monroe, and Mayhew. Also notes the New Choctaw Agency. Just four years after this map was made the Chickasaw and Choctaw would forcibly relocated westward in the infamous 'Trail of Tears.' This map was updated yearly from 1824 to the mid 1830s. A full series of these maps is a powerful illustration of both the American Indian relocations. Also of interest are the several roadways that run northwest through the Chickasaw and Choctaw territories. These are the Old Natchez Road (also called the Natchez Trace), the Robinson Road, and Jacksons Road. The roadways through the Indian territories were mostly traveled by missionaries and a hardy group known as 'Kaintucks.' Kaintucks were river men who made a living transporting goods down the Mississippi from Ohio and Indiana. Afterwards they would travel north by land from Jackson to Nashville, where they could once again navigate the rivers back to Ohio. In the early 19th century over 10,000 Kaintucks a year used these roads. The Robinson Road was also the primary postal route.